There’s a sense of wonder, awe, and amazement that is inherently connected to whale watching. If you’ve ever seen one of these ocean giants breach the surface of the water, you know exactly what that rush of excitement feels like, and why so many people are drawn towards chasing the Whale Trail. A highlight of the 4th Annual Coastal Discovery & Stewardship Celebration, the Whale Trail is a series of spots along the Pacific Coast where the public may view whales, dolphins, orcas, and other marine life from shore. Lucky for us, 7 of the 50 viewing sites are located here on the Central Coast, meaning that we will have more shore-based vista points in our county than in any other place along the Whale Trail. By establishing this network of viewing sites, the Whale Trail’s mission is to inspire appreciation and stewardship of whales and our marine environment. Visit any of the Central Coast Whale Trail spots listed below, and let the whales themselves show you the importance of becoming a wildlife steward. Located on the iconic Highway 1, the Whale Trail viewing point in San Simeon is situated 7 miles south of the Piedras Blancas Light Station. Each year between March and May, the Eastern North Pacific Gray Whale Cow/Calf Production survey occurs at this sloping terrace above the Pacific, making it the perfect place to view whales during their migrations each year. 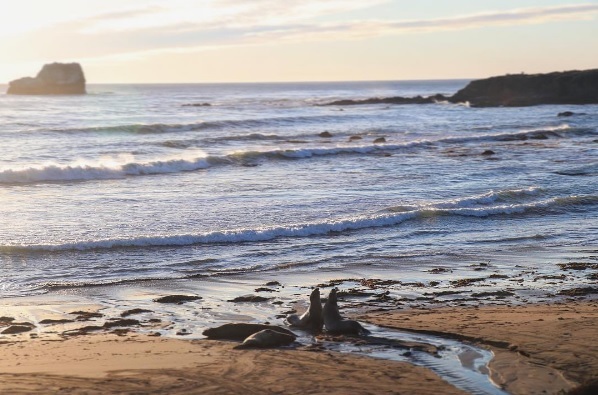 If you’re looking to experience more marine mammals on your outing, stop by the Elephant Seal vista points along the drive. The official Whale Trail view point in Cambria is located at Shamel Park, a 6-acre community park with beach access and expansive ocean views. 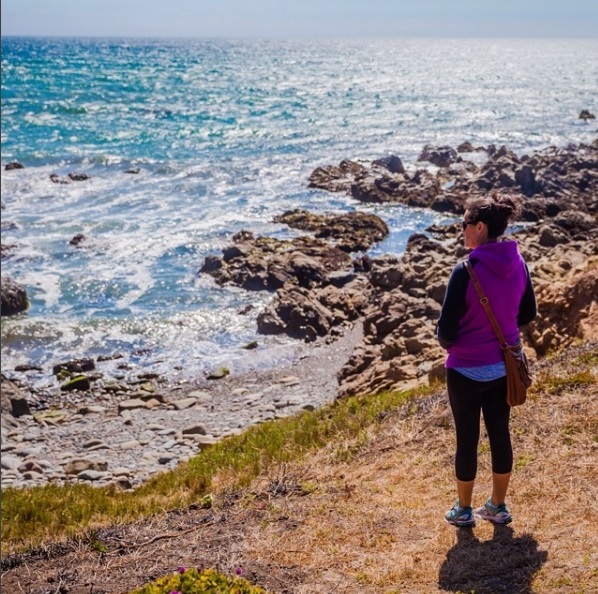 Off of the coast of the charming town of Cambria, you’re most likely to spot the whales around Leffingwell Landing Trail, Moonstone Beach, or anywhere along the breathtaking ocean bluffs that this area is known for. Catch the California Gray Whales on their migration south between late December and Feburary, or view them between March and April as they begin their migration north. This cute and classic beach town offers visitors the perfect opportunity to experience marine life of many different kinds in a variety of ways. View playful dolphins from the Cayucos pier, get a glimpse of a humpback whale as you walk along the shore, listen for the barks of sea lions soaking up the sun on Mouse Rock, or discover starfish and sea urchins as you explore the tide pools. Tip: the best time to see Gray Whales is between March and April because the mothers and calves travel closer to shore as they make their way north towards their feeding grounds in Alaska. 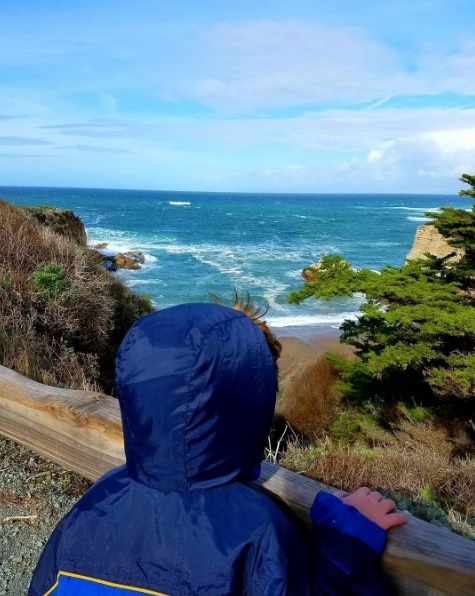 This state park is one of the most beloved spots on the Central Coast, known for being one of the best locations on the Central Coast for watching the sunset or for viewing wildlife. 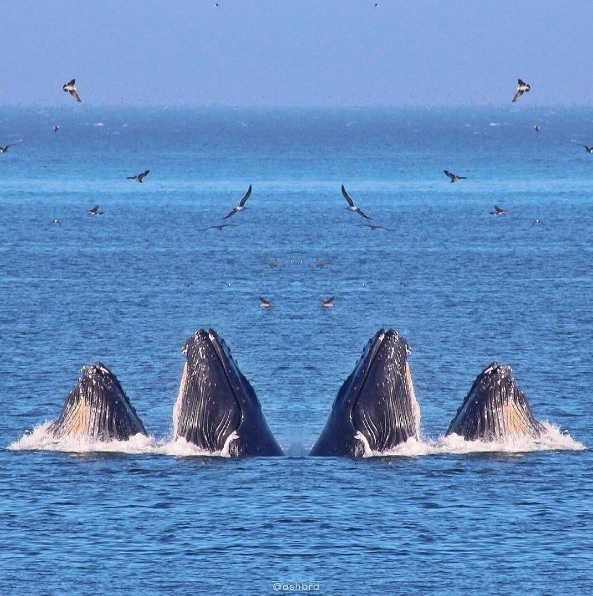 You can view whales year round in Montana de Oro, but the best time to see them is between December and April. After whale watching, visit Corallina Cove to see harbor seals, southern sea otters, sea stars, sea anemones, and more amazing marine life. In the last few years, large numbers of gray and humpback whales have been appearing annually in Avila Beach to feed during their migration. 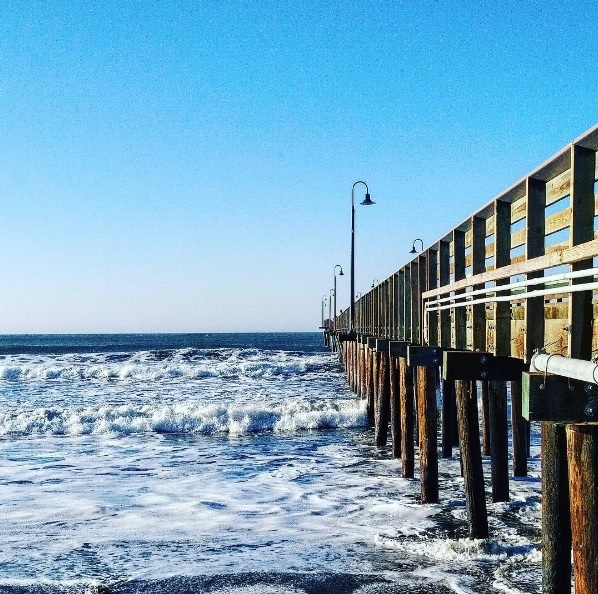 Located on the Avila Beach Pier, this Whale Trail spot will give you the perfect view whales spouting water or making big splashes as they breach the surface. If the whale spout is heart-shaped, it’s a gray whale, whereas if the whale spout is tall and bushy, it’s a humpback whale. You’re likely to see humpback whales hanging out in beautiful Avila year-round, and most likely to see gray whales migrating between December and April. Tip: look for large groups of birds along the water because they feed on the same krill that the whales and dolphins do. 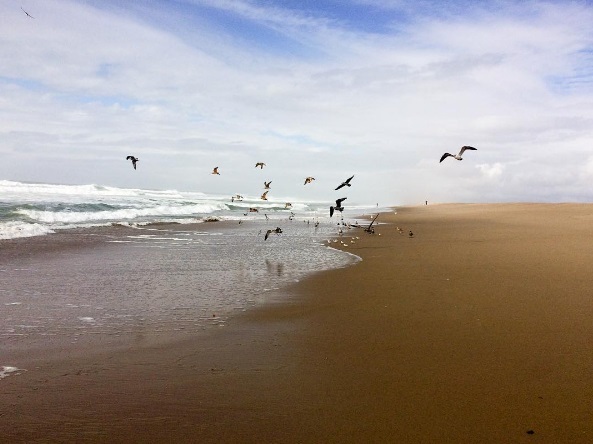 Dominated by dunes, the sandy shores of Oceano and Nipomo serve as an excellent habitat for a variety of marine life and birds. For the best view, visit the Guadalupe Dunes Center and the Oso Flaco Lake Natural Area. 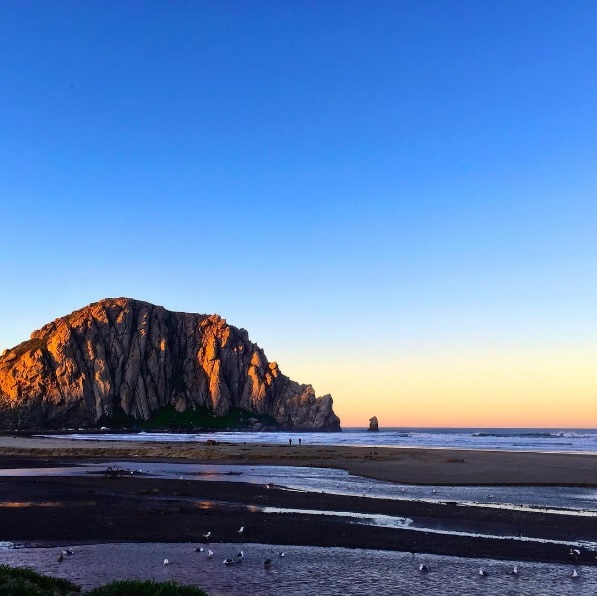 Famous for the Morro Rock, this waterfront town is one of the most easily recognizable spots on the Central Coast. While whales don’t often enter the bay itself, they do love to play and feed in Estero Bay. This stunning vantage point provides visitors with panoramic ocean views where you will witness whales breaching and feeding. You will find gray whales and humback whales passing through from December through April, just like many of the other Whale Trail view points listed here. If you’re lucky, you can even catch a glimpse of the most abundant baleen whale in the world, the Minke whale, in Morro Bay. However, try not to blink because these whales are small, fast, and hard to observe or track at sea.